Correspondence, photographs, original pencil sketches, and other materials relating to Beach’s designs for various medals and commemorative coins, including the Peace of Versailles Medal, Charles Coffin Medal, and the 1923-S Monroe Doctrine Centennial half dollar. Chester A. Beach (1881-1956) was a sculptor and medalist. 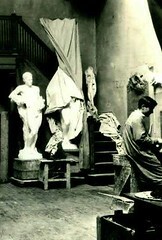 American sculptor Chester A. Beach (1881-1956) was born in San Francisco, moved to New York City in 1903, and then to Paris in 1904 where he attended the École des Beaux-Arts. He returned to Manhattan in 1907 and established a studio he maintained for forty-five years. In 1915 he designed three statues for the Panama-Pacific International Exposition and received a silver medal. In 1919 his entry was selected in a competition held by the American Numismatic Society (ANS) for the design of a peace medal commemorating the Treaty of Versailles. ANS awarded Beach its Saltus Medal in 1946 in recognition for his work in medals. Materials relating to Beach’s designs for various medals and commemorative coins. Items pertaining to his design of the 1923-S Monroe Doctrine Centennial half dollar include original pencil and color sketches; letters from Chief Engraver of the U.S. Mint George T. Morgan (undated); a letter from W.L. Halberstadt, coin distribution director of the American Historical Review and Motion Picture Industrial Exposition (1923); photographs of the Monroe Doctrine coin models; photographs of a Chase Manhattan Bank coin exhibit; pictures of portraits and medals of James Monroe, John Quincy Adams, and others used as models for the coins; and six original pencil sketches of Monroe and Adams. Materials relating to other medal designs include correspondence and photographs of coins designed for the Republic of Columbia (1935); photographs of coins and clippings pertaining to the American Numismatic Society Peace of Versailles Medal of 1919; correspondence, pencil sketches, photographs, and background materials relating to Beach’s design of General Electric’s Charles A. Coffin medal (1923-1928); letters, notes, sketches, and photographs relating to Beach’s design of the 1919 Cross of Military Service of the United Daughters of the Confederacy (1919-1945); and correspondence and other materials on the American Gas Institute Beal Medal (1909), Saint Nicholas Society Anniversary Dinner Plaquett (1966), Actors Fund Medal (a Gutzon Borglum letter regarding trouble with a die cutter, 1910), School Art League Saint Gaudens Medal (1917), National Committee on Prisons and Prison Labor, A.T. & T. Long Service Button (1928-1929), Persy Hammond Medal (1937), and Luquer Medal of Bedford Garden Club (1948-1949). Correspondence from 1966 to 1969 consists of letters between Beach’s daughter Eleanor (Mrs. Paul R. Fitchen) and Charles Fuller regarding the Children’s Year Medal of 1919. Also present are four photographs of Beach, three portraits and one snapshot of him in his studio at 207 East 17th Street, Manhattan. David Hill, “Frozen in Time,” ANS Magazine 10:1 (2011), 28-29.